Competence in any profession depends upon an understanding of the theory that underlies it. This concise and practical text for students and practitioners bridges the gap between occupational therapy theory and clinical practice, offering highly practical advice on using theory in practice in a wide range of settings. It considers the nature of professional practice and the need for a sound theoretical basis from which to plan, implement and justify interventions, and investigates the practical use of occupational therapy theory and the issues such use raises in health and social care settings from a European perspective. Every occupational therapy student worldwide needs to know about the underlying theory of their profession and its application to practice. 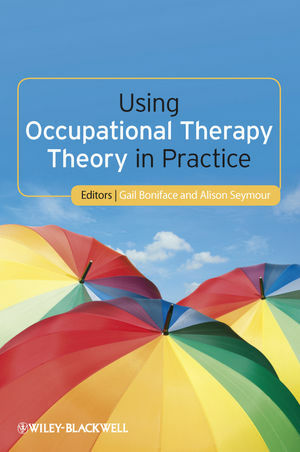 The book particularly debates the nature of the theory of occupational therapy via the introduction of the concept of models of the profession as an umbrella for practice, all of which is brought to life via case studies incorporating expert advice, reflection exercises and assessment and evaluation forms. Dr Gail Boniface is Senior Lecturer & Programme Manager at Cardiff University. She has been teaching theory since 1987. She developed student handouts and teaching material into short courses on models of occupational therapy. These courses included definitions of terms related to theory and were delivered across Wales and England. They were then turned into a module on the MSc in Cardiff University for qualified practitioners. She also delivered similar key note lectures and courses in Germany, Sweden, Croatia and Poland. In more recent years she has worked with Gloucestershire Primary Care Trust to instil theory and the use of a model in the occupational therapy service there. Alison Seymour is Lecturer & Admissions Tutor at Cardiff University and currently teaches the use of models on the postgraduate diploma in occupational therapy. Over a 19 year career in occupational therapy practice in mental health she has used the Activities Therapy Model, Model of Adaptation through Occupation and The Model of Human Occupation in a variety of community and hospital settings.